E-mail marketers are so busy getting out communications that they often overlook a most important job: acquiring more subscribers. Every e-mail marketer loses from 10% to 30% of his house file every year due to unsubscribes or undelivers for various reasons. If you don’t set up an aggressive plan to add more subscribers, your audience will dwindle down to nothing in no time at all. There are ten things that every e-mail marketer should start doing right now. Some are easy, some are difficult. Some are inexpensive, but all are really necessary if you are going to be successful in e-mail marketing. By now, most marketers have realized that e-mail addresses cannot be purchased or rented like direct mail addresses. There are more than 40,000 direct mail lists of consumers in the US for rent or sale. Renting and sending direct mail to these names is legal, ethical and widely used. You can’t do that with e-mail. It is SPAM and illegal. You have to acquire subscribers yourself. Here is how to go about it. Your first step is to determine what your subscribers are worth. 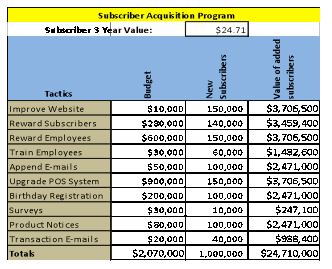 I have worked with a dozen different clients, helping them to determine their three year subscriber lifetime value. We got all sorts of values – based on their products and the success of their e-mail programs – but the average turned out to be somewhere between $20.00 and $50.00. I can’t go over the details of LTV calculation in this short article. 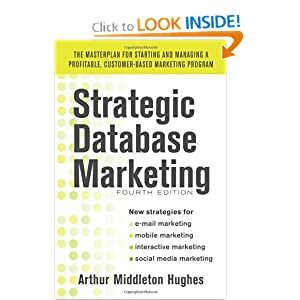 You can find out more about it in the book that Arthur Sweetser and I published last spring: Successful E-mail Marketing Strategies: from Hunting to Farming (RACOM 2009). Once you know the value, however, you are well on your way to having what you need to support a budget for acquiring more. If, for example you find that the net profit (not revenue) that you receive from the average subscriber over three years is $24.71, then, if you can acquire 1,000,000 more, your company profits will go up by $24.7 million dollars. That is serious money. The next steps in acquisition are pretty obvious. First and foremost is to make sure that subscribing is featured on your website and in all your transaction e-mails. Too many marketers hide the subscription link in fine print at the bottom of their website, with no obvious call to action. Just putting the word “Registration” somewhere is not enough. The words should say, “Register now to get these great benefits…” as Nike does. If your subscriber is worth $24.71, you can afford to give something to subscribers to reward them. It could be free shipping, or discounts on certain products, or anything else that you can think of. The often most overlooked source of new subscribers is your customer contact staff. Everyone who talks to or meets with a customer should have an easy way to ask for the e-mail and to put it into your system. Smart marketers reward their employees for doing this. If the subscriber is worth $24.71, why not give $5 to any employee that enters a new e-mail address. When you get the address in your system, send an immediate e-mail to the new subscriber saying “Do you want really to receive e-mail promotions from us” or some such language. If the address is new (not in your system) and valid (it gets delivered) and the subscriber clicks “Yes” then you put $5 in your employee’s pay envelope. Train your employees to ask for the e-mail, giving them the answers to customers’ questions. Avis uses e-mails that confirm a car reservation to ask renters to sign up for e-mails. Car reservation e-mails have a very high open rate – and as a result Avis has signed up millions of subscribers in this way. Borders UK set up their POS system to collect e-mail addresses at the cash registers. When customers sign up, they get a welcome message the very next day that includes a discount voucher to prompt a second visit. Borders found that e-mail subscribers had 38% higher transaction values than other members. Thirteen percent of the welcome vouchers were redeemed. With this system Borders increased their subscriber base by 630,000 in 17 months. Bubbles Car Wash had been collecting customer e-mails while the customers were having their cars washed. The data was so poor, it was almost unusable. So they improved the software on their POS system to recognize any customer whose e-mail wasn’t on file. Those people’s receipts (and only those) got a coupon for a premium car wash – worth $28.95 – if they went to the Web site and used the coupon code to enter their valid e-mail address. As a result, Bubbles boosted their e-mail list by 71.4%. The subsequent e-mails sent monthly to subscribers produced $70,000 per weekend in increased revenue. Any company that sells through catalogs or off line builds up thousands or millions of customer addresses. You can send your customer file to biz.Fresh Address.com. One company that did this on a regular basis sent 15 million+ names quarterly for matching. Every quarter more than four million e-mails were appended and sent messages asking if the recipient wanted to receive e-mails. Result: more than one million consumers said, “Yes” and became active subscribers every quarter. Probably the most rewarding but expensive methods of capturing e-mail addresses is to do what Borders did: upgrade your POS system. Some restaurant POS systems are capable of storing the names, addresses, telephone numbers and email addresses. An ideal retail system is one that lets the customer enter her own data while the clerk is scanning the items in her shopping cart. Three other “musts” for acquiring customer e-mails is to be sure that every ad, every piece of copy and every product sent to a customer or prospect should have a registration inducement. Oakley packs a postage free post card in with products so that customers can send in their data. Wal Mart encourages gift returners to enter their e-mails. Product ratings and reviews are also an excellent way to interact with customers, getting them to provide their e-mails. People love to see their name in print. After providing a review, they can click back on your website and read what they entered.